July 10, 2014, 12:46 p.m. The idea was that, rather than shut a lot of good content off from the free web, maybe you could increase digital revenue by creating a “premium” experience — a nicer look, getting rid of ads — and charging people 12 bucks a month to access it. As the DMN story notes, the premium experience was also “launched with promises of personalization and loyalty programs to come later,” which never really materialized. @saila Just frustrating. It’s my old paper! I love it! And this seems dumb. Hope I’m wrong! @abeaujon Bottled water offers convenience and portability. Those are real things! This is rectangles. @abeaujon I am totally on board with the idea that dropping the paywall could be smart. Not on board with what the premium here offers. • The marketing/sales folks who were effing this cat never got newsroom buy-in. Top newsroom folks were against the premium site from Day 1. Once the premium site went live and starting siphoning traffic (not much, but some) from the basic site, the newsroom freaked. Understandable, since you were diluting the newsroom’s only real measure of success. And even if you think big gray corporate newsrooms need disruption, you’re not going to convince them when your efforts fail spectacularly. The number of non-subscribers who actually came to the premium site, looked around, and said, “I’ll pay for this” was “a fingers-and-toes” number, I was told today. • They have to do what Dyer wrongly says they’ve done: Take valuable lessons from their failures. The DMN learned NOTHING from this it didn’t already know. The paper learned it with its paywall, and its tablet app, and when it tried to charge for high-school scores: People won’t pay for content that is ubiquitous, and the newsroom will (perhaps rightly) sabotage any effort that doesn’t get its reporters the biggest audience possible. Benton, Joshua. "The Dallas Morning News abandons its “premium experience” strategy." Nieman Journalism Lab. Nieman Foundation for Journalism at Harvard, 10 Jul. 2014. Web. 20 Apr. 2019. Benton, Joshua. 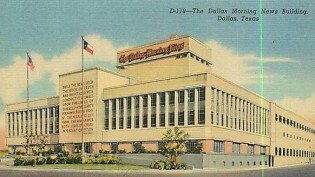 "The Dallas Morning News abandons its “premium experience” strategy." Nieman Journalism Lab. Last modified July 10, 2014. Accessed April 20, 2019. https://www.niemanlab.org/2014/07/the-dallas-morning-news-abandons-its-premium-experience-strategy/.